Once I enroll and elect to have electronic delivery of my statements (eStatements) will a paper copy still be mailed to me? No. Once enrolled in eStatements you will no longer receive paper statements for the enrolled account. Can I receive a paper statement and an eStatement if I want to? Yes. 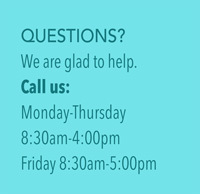 Please call our customer care center at 207.288.3685 and one of our representatives will set this up for you. Will registering this account enroll all of my accounts for electronic statement delivery? No. We understand that you may want to receive some printed statements and some electronically, so we allow individual enrollment for each account. How can I go back to paper statements if I change my mind about receiving eStatements? Please call our customer care center at 207.288.3685 and one of our representatives will change your preference back to paper delivery. This depends on when your statement is produced. Many of our statements are available around the 3rd of the month. If you would like to discuss your situation with a representative, please call our Customer Care Center at 207.288.3685.